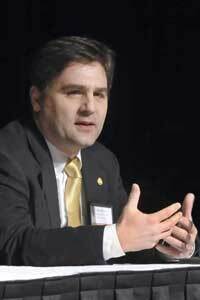 State Sen. Patrick Colbeck, R-Canton, touts the impact of Right to Work legislation he was instrumental in passing. In October, Colbeck was stripped of all committee assignments, a rare move that a spokesperson for GOP Majority Leader Arlan Meekhof attributed to “multiple concerns.” Colbeck also has been a cheerleader for Michigan’s passage of Right to Work legislation, which prevents companies and unions from making workers join a union and pay dues as a condition of employment. We find Colbeck’s claim is mostly inaccurate, because it lacks evidence tying Michigan’s post-recession job growth to the Right to Work. On Dec. 11, 2012, Snyder’s signature made Michigan the 24th state to prohibit requiring workers to pay union dues or fees as a condition of employment. The bill was sponsored in the Senate by Meekhof, with Colbeck joining 21 other Republicans in supporting the measure, which passed 22-16. That article also credits the pair, and other activists, with creating the “Michigan Freedom to Work” coalition to drive support for Right to Work as it held press conferences in June 2011 and September 2011 in favor of it. But Colbeck’s claim that “in the wake of passage” of Right to Work the state has “created 540,000 private sector jobs” looks like fuzzy math at best. According to the U.S. Bureau of Labor Statistics, Michigan added about 336,000 private jobs from the fourth quarter of 2012, just before Right to Work took effect, to the second quarter of 2017, the most recent data available. The claim of 540,000 added jobs only works if the starting point is at the end of 2010, just before Snyder took office. That was nearly two years before passage of Right to Work. According to BLS data, the state added 533,000 private sector jobs from the last quarter of 2010 to the second quarter of 2017. There have been plenty of studies on Right to Work and their results carry a similar theme: While RTW laws can create a more positive economic climate, it is difficult to separate the policy from other factors that affect hiring. A study from Illinois found RTW laws had no significant impact on employment, and hurt other aspects of the economy. A UCLA study found private workers in RTW states earned anywhere from 1 to 6 percent less than similar workers in non-RTW states. A third study found RTW led to more manufacturing jobs in Idaho, but no discernible effect on employment or wages in Oklahoma. Truth Squad asked the Michigan Economic Development Corporation if the agency could cite examples of companies locating in Michigan because of RTW. The agency would not publicly respond. Colbeck’s third claim, that Michigan job growth has been accompanied by a growth of $10,000 in income per resident, is also problematic, and for some of the same reasons as the job numbers. It's true that when comparing raw numbers, per capita income in Michigan has grown by about $10,000 - from $35,188 at the end of 2010 to $45,211 at the end of the third quarter of 2017. (When adjusted for inflation, it's just under $5,600.) However, income growth since Right to Work became law is more modest: At the end of 2012, per capita income was $38,699, which means that income has grown about $6,500 since (roughly, $3,600 when adjusted for inflation). Colbeck can rightly claim credit for taking an early grassroots role in pushing passage of Right to Work. But his assertions on job and income growth miss the mark. He overstates private jobs gained “in the wake” of Right to Work by 200,000 jobs. And his campaign provides no persuasive evidence RTW was responsible for the state’s job growth since 2012. He also overstates how much per capita income has grown dating to the passage of Right to Work. Michigan’s growth since 2012 coincides with the state’s broad recovery from recession as Snyder took office. Economists cite several factors, including the rebound of the state’s critical manufacturing base, as pent-up demand for cars and durable goods drove sales and hiring upward. By 2013, U.S. dealers were on track to move 15.6 million cars and trucks – up 50 percent from 2009. By 2014, it was 16.5 million. In a state where manufacturing “remains the backbone of the economy,” according to the W.E. Upjohn Institute for Employment Research, that, as much as anything, accounts for the state’s economic turnaround. Interesting the level of scrutiny and demand of evidence given for Colbeck's statement verses what was given in previous article concerning Thanedar's even dumber tweet. And Bridge isn't in the bag for the leftwing canidates? Naturally, The Bridge will provide compelling statistics showing how compulsory union membership caused Michigan employment statistics to explode in the past? I know that businesses, especially new start ups, just love dealing with another layer of bureaucracy in their day-to-day operations. Should be a good read. Can Bridge factor out any new jobs created in non-union shops when determining the job growth impact of RTW? Non-union shops wouldn’t be affected by RTW, would they? So to measure the impact of RTW, you should be counting jobs added in union shops, specifically counting non-union workers in union shops. How has that segment grown?